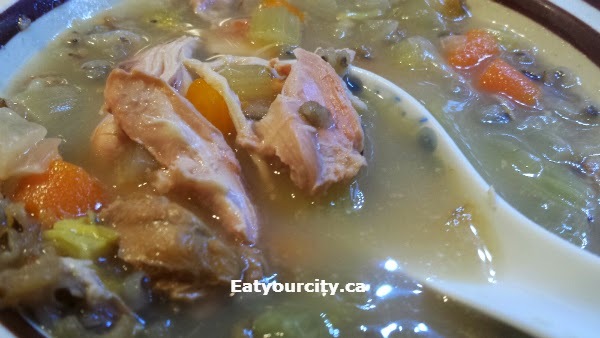 Eat Your City: Slowcooker wild rice, turkey/chicken, vegetable soup and turkey stock recipe! Perfect for leftover roast turkey! 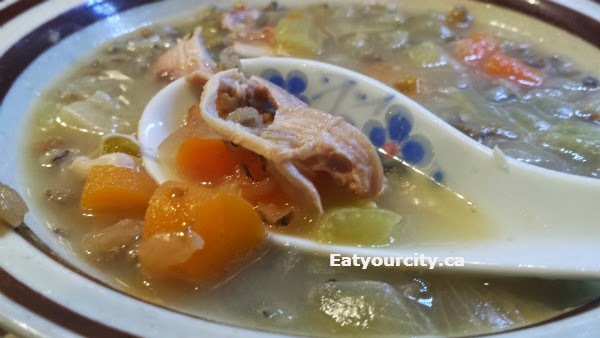 Slowcooker wild rice, turkey/chicken, vegetable soup and turkey stock recipe! Perfect for leftover roast turkey! First up, if you want to have extra stock on hand, toss the bones of 1/2 a turkey into a crockpot, add in 2 roughly chopped onions, 2-3 bay leaves, a teaspoon of salt and fill it up with water (up to about 1/2 inch to the pot). Then crank it on low for 8 hours, skim off the fat, discard the solids and you have yourself some awesome easy turkey stock. I usually divvy mine up into containers and freeze them until I need to use them. If you're just interested in making a wild rice, turkey/chicken, vegetable soup, here we go! I usually make multiple batches (minus the broth), place them into zip lock bags and I have easy ready to go crockpot soups whenever I want! If you want better flavor, instead of arranging them all nicely for a picture, sautee the veges and sear the chicken in a 1 teaspoon of oil or butter before tossing into the slowcooker. 1) If you have time, in a large deep frying pan, add 1/2 teaspoon oil or butter, and on medium high heat, sear the chicken until browned, about 1 minute per side and toss into the slowcooker. Then add remaining oil/butter and sautee all the vegetables, garlic and seasonings about 10 minutes and dump into the slowcooker. If you're in a rush, just add everything but noodles (if using) into the slowcooker. 2) Pour in the broth, then add in the wild rice/rice and top up the crockpot/slowcooker pot with water until about 1/2 inch from the top (the soup will reduce and not overflow). Set the crockpot/slowcooker to low for 6-8 hours. 3) Take out the chicken (if using, remove bones and shred the meat - put meat back into soup), or add in the left over roasted turkey meat. Add in the egg noodles (if you didn't like rice) about 30min before you plan to serve the soup so it has time to cook. Season with salt and pepper to taste. Enjoy!